Your smile is one of your most important personal and health assets. If you are searching for the best children’s and family dentist in the areas of Kaukauna, Appleton and Freedom, WI, here are some common sense tips to guide you on your journey. 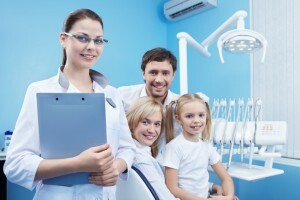 The best dentist for you and your family creates a warm, welcoming stress-free environment for his or her patients. Treatment rooms should be clean, orderly and comfortable. You’ll want a friendly staff that’s willing to answer questions. Most of all, the family and children’s dentist in Freedom, WI calms the anxious patient with sedation options, values patient teaching and welcomes patient participation in treatment plans. Your state dental society or local university dental school provides the public with lists of area dentists and their specialties. Check your prospective dentist’s educational credentials, especially if you have a particular dental need such as periodontal care, orthodontics or special needs dentistry for a child or other loved one. Look at online reviews and testimonials, too. And for the most personal touch–ask a respected co-worker, neighbor or relative whom he or she would recommend as your new family and children’s dentist in Kaukauna. Extensive training and continuing education produces a wide offering of dental treatments that prevent cavities and gum disease, restore teeth to full health, and dramatically improve smile aesthetics. Additionally, the best Appleton family dentist uses modern diagnostics such as DIAGNOdent handheld lasers, digital x-rays and intraoral cameras to uncover hidden problems at their earliest stages. He or she should offer preventive and protective measures such as snore guards for sleep apnea, athletic mouth guards and mouth guards that stop teeth grinding and clenching. How can you test a doctor’s dexterity and artistic ability? Simply ask to see before and after pictures of complex restorative treatments the dentist has done or to view a “smile gallery”–photos of finished cosmetic treatments. If you are contemplating getting porcelain veneers, for example, or a dental implant, inquire as to how many of these procedures the dentist does annually. Any restorative or cosmetic work should aim at natural, age-appropriate results, not a cookie cutter look. Your search may lead you to Dental Expressions in Freedom, WI and the capable,caring hands of Drs. Robert and Heather Heil. Contact their office to arrange for a one on one consultation. Ask questions, and we think you’ll find this husband-wife dental team to be the perfect family and children’s dentists for you and yours.